Baduk has experienced a tremendous growth in popularity around the world in the past few decades. Accordingly, the eastern Asian countries of Korea, China, and Japan have seen a huge increase in the number of visiting students and players from overseas. The reasons are diverse. A foreign professional may want to explore a new playing field, couples relocating to another country who are also Baduk pros may be competing internationally, and curious and talented students from the west have gained admission to some of the most prestigious and competitive Baduk schools in eastern Asia. Yoo KyungMin 5 dan, a 24-year-old Korean pro, made a surprising announcement that he will move to Taiwan and start participating in the pro leagues there. His reasoning was refreshing; instead of entering and competing in the already saturated market of Korea, he would like to explore his options at another place with huge upsides like Taiwan. The Taiwanese Weichi Association had already granted him a guest pro status, which will allow him to compete in all Taiwanese-sponsored tournaments. This appears to be a win-win situation for both sides, as Taiwan will get a competent player who will create more interest and competition within its market, and Korea a figure who would serve as a valuable connecting bridge between the two countries. At the same time, a Chinese pro named Meng Zhaoyu had announced her intentions to play and receive additional training in Korea. Having won second place in the Chinese Women's Myungin tournament, she is seeking to experience the Korean style in hopes of furthering her advancement in Weichi. She is tentatively scheduled to spend two years at one of the most prominent Baduk programs in Korea, the Kweon KabYong School of Baduk. Korea's Kim HyunJung 3 dan had moved to Japan back in 1994 and become a pro there three years later. The older sister of Kim HyoJeong 2 dan, Kim HyunJung wed Nakane Naoyuki 8 dan of Japan earlier this year. Kweon HyoJin 4 dan, who has been married to a Chinese 4 dan for some time, is running a successful Baduk academy in Beijing, China. Time will tell if her school will someday surpass his father's excellent reputation. International involvement, however, does not always guarantee positive consequences. Some of the best ranking amateurs in Korea had attempted to pass the admissions test in Japan, only to be turned away by their policy that restricts foreign nationals from participating in their admissions process. The applicants have since filed a lawsuit in the district court, with its result still pending. It is a cautionary tale against blind optimism regarding the internationalization of Baduk today. The number of foreign students studying in Korea has increased exponentially. For example, Hungary's Diana Koszegi is a full scholarship student at MyongJi University majoring in Baduk studies. Apithet Zirasophin of Thailand, a visiting student at the same university, chose to study in Korea as he liked the prospect of obtaining a concurrent bachelor's degree while studying Baduk. France's prominent amateur Pierre Audouard had also stayed briefly in Seoul years earlier. 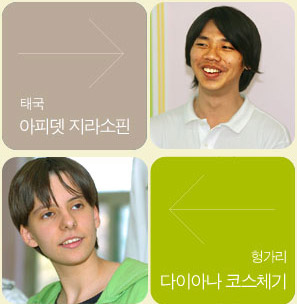 Alexander Dinnerstein and Svetlana Shikshina 1 dans had come to Korea from Russia, and both had since passed the admissions test to earn pro status. 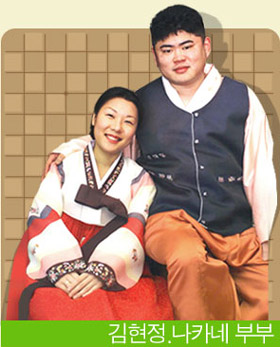 Upon his marriage Alexander had moved back to his home country, while Svetlana still remains in Korea and has done so for 9 years. With the increasing popularity and demand for Baduk from overseas, China, Korea, and Japan have started to move towards an open door policy to the world that's been long overdue. They have begun to permit foreign students to study in their programs and are opening their markets to foreign professionals and even inviting them into their leagues, albeit gradually and carefully. The trend does not appear to slow down any time soon, and I see this as a positive development for the good of the game.